CARRBORO Ronald Bilbao will remember his 21st birthday not for gifts that he received, but for one that he gave.This year on his birthday, Bilbao, a rising senior at UNC-Chapel Hill, sponsored his parents for legal residency in the United States - 25 years after they left their native Venezuela for Miami. His parents had been among this nation's estimated 12 million illegal immigrants, with no way to rectify their immigration status, since 1984. But several years ago, they discovered that they were among a small group of illegal immigrants who have a path to citizenship. In the nation's complex web of immigration laws, there is a provision that allows people who entered the country on legal visas and remained after the visas expired to apply for permanent residency - but only if they have an immediate family member who is a U.S. citizen and at least 21 years old. Ronald, a U.S. citizen born in Florida, was their ticket. He signed the forms on his birthday, Jan. 8, and in March, Bilbao's parents received green cards that allow them to live permanently in the United States. It was a joyful occasion for his family. It was also a lesson in the arbitrary nature of U.S. immigration laws, which forgive some illegal immigrants and provide no remedies for others, Bilbao said. Because he was born in Florida, the U.S. immigration system gave Ronald Bilbao all the rights of a U.S. citizen and allowed him to get a full scholarship to UNC-CH. It left his family, including his brother, who came to this country when he was a baby, on the margins of society for more than two decades before excusing their violations. "I didn't do anything differently," Bilbao says. "I'm just lucky. And I had to wait 21 years so I could finally do something to help my family." The law that helped Bilbao's family works for only a small number of immigrants. It applies only to people who entered the country on legal visas, an estimated 45 percent of the nation's illegal immigrants. It excludes those who crossed the border without a visa or committed any legal infraction, such as using false documents to get a job. Arcane provisions of the law bar still more people, on the basis of criteria such as the year they entered the country. It will not help the majority of North Carolina's illegal immigrants from Mexico, many of whom sneaked across the border by swimming across the Rio Grande River or hiking through the desert. Cases such as Bilbao's give fuel to both sides of the nation's contentious immigration debate. Some anti-illegal immigration activists point to them as a reason to cut back on family-based immigration, and to deny citizenship to the children of illegal immigrants. They say that violating the law shouldn't be rewarded with the chance to gain legal status. Mark Krikorian, director of the Center for Immigration Studies in Washington, which pushes for stricter immigration enforcement, said the case shows the need for tighter laws that punish people who over-stay visas just as they punish border jumpers. "We need to deal with the illegal immigrants who are here the same way, regardless of how they got here," he said. Immigrant advocates agree that cases such as Bilbao's point to a fundamental unfairness in the law. They argue that the nation needs immigration reform that would give all illegal immigrants equal opportunity to earn legal status. Jack Pinnix, a Raleigh immigration lawyer, called current law "an irrational patchwork of happenstances that divides families." Bilbao's parents, Lucia Romero and Henry Bilbao, moved to Florida in 1984 with their infant son, Robert. All had visas that allowed them to come legally, but the documents eventually expired. Lucia Romero said they had a good life in Venezuela; her husband had a business importing auto parts, and she worked as a secretary. But her husband traveled frequently to the United States for business, and he became passionate about raising his children in what he saw as the land of opportunity. "We moved for better education for our children," she said. Growing up in the multicultural mix of Miami, Ronald and Robert say, they didn't understand the concept of being illegal immigrants. They occasionally heard their parents talk about not "having papers," but they didn't know what that meant. Lucia Romero said they went to legions of lawyers, trying to find a way to gain legal status, always hitting dead ends. Even a 1986 amnesty that legalized millions of immigrants didn't help. But their status had little effect on their day-to-day lives. Her husband continued to run his auto-parts business, and she found work as a housekeeper. Immigration laws went all but unenforced for years, so they never feared deportation. 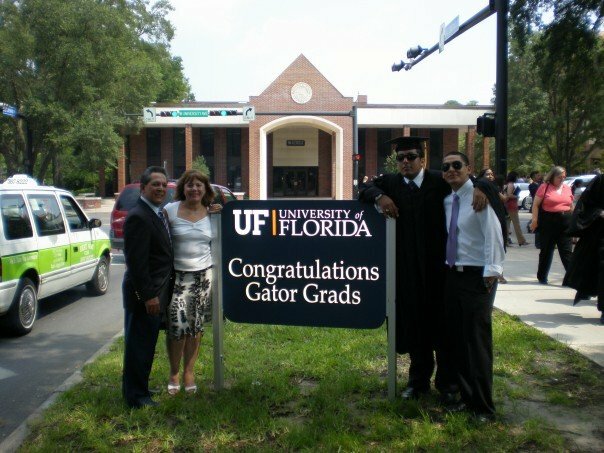 It wasn't until 2001, when their elder son Robert began applying to colleges, that their immigration status began to have serious consequences. Robert, who graduated among the top five in his high school and dreamed of becoming a doctor, was accepted by Cornell University and by UNC-Chapel Hill. But his immigration status disqualified him for student aid or loans. He was forced to turn down the slots and, for a while, give up his hopes of a college education. "I've come to identify myself as a man without a country," says Robert, who still lives in Miami. "I'm not American enough for America, and I'm not Venezuelan enough for Venezuela." Robert eventually found a way to attend the University of Florida and earned legal residency by marrying his girlfriend. He is now a teacher and hopes soon to begin medical school. But he and Ronald watched things become increasingly difficult for their parents as immigration laws tightened in recent years. They were unable to renew their driver's licenses, and the fear of deportation, once unimaginable, crept in. Ronald said he didn't fully understand his family's situation until he entered college in 2006. He knew the specifics - his brother couldn't get financial aid and his parents couldn't get passports or driver's licenses - but he didn't know that their problems fit into a broader national problem. He had no idea that there were tens of thousands of students like his brother, unable to go to college because of their immigration status. "I thought it was just bad luck on our part," he says. He figured it out only when he began studying immigration issues, and talking with other students who were engaged in the debate over national policy. Now, he is the leader of a group he founded at UNC-CH, the Coalition for College Access, which advocates allowing illegal immigrants to attend the state's universities and colleges. His family made it to the other side of this country's immigration morass. But he said he cannot celebrate their success without also feeling guilty - that he is attending a college his brother couldn't, that he was able to help his family in a way that most children of North Carolina's illegal immigrants cannot. And guilty that, when he went home for spring break, his father felt the need to thank him for the gift of legal residency. Staff writer Jennifer Klahre contributed to this report.